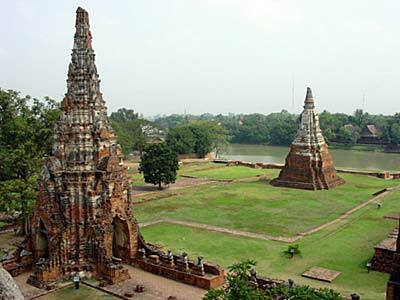 The kingdom of Ayutthaya existed between 1350 and 1767 A.D. and was founded by its first ruler King Ramathibodi I. 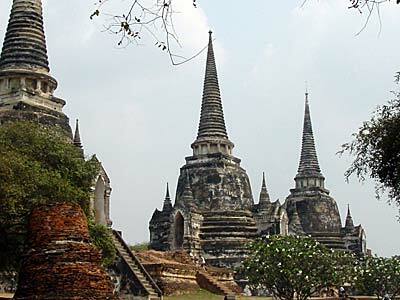 The prior and short-lasting kingdom of Sukhothai to the North was absorbed into Ayutthaya. Theravada Buddhism became the official religion early on and King Ramathibodi I also compiled a legal code. The Thai rulers of Ayutthaya were absolute monarchs. They assumed the title of 'devaraja' (god-king) as opposed of the title of 'dhammaraja' during the Sukhothai period. As devaraja the King became an earthly incarnation of the lord Shiva. In geopolitical terms, Ayutthaya rapidly became a very strong power in southeast Asia. 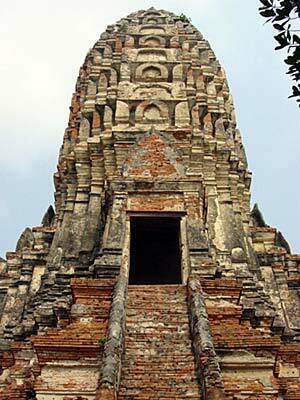 The history of Ayutthaya is a also a history of repeating wars with its neighbors. While Ayutthaya was ascending, the Khmer empire that had ruled large parts of present day Thailand, was already in decline. Angkor was eventually truly defeated in 1431. Thai rulers were also involved in repeated conflicts and campaigns : rebellions in Sukhothai ; trying to subdue the northern city of Chiang Mai ; trying to control the trade in the Malay Peninsula. Interestingly, very soon after the Europeans started sailing around the world in the 16th century, they made contact and established trading relations with Ayutthaya. the Portuguese arrived first and a Portuguese embassy was established already in 1511. Later on, also Dutch, English, Danish and French people came to visit and stay in Ayutthaya. There were also important commercial ties with the Japanese. Foreigners were especially welcomed during the reign of King Narai the Great (1657-1688). Later on however, foreigners were expelled and Ayutthaya sealed itsef from the West. To the West, the Kingdom of Ayutthaya faced its most formidable adversary. The Burmese overrun Chiang Mai and Laos in the mid 16th century, and captured the city of Ayutthaya for a first time in 1569. They installed a vassal king at Ayutthaya. However, the control over Ayutthaya by the Burmese was shortlived, and King Naresuan the Great (1590-1605) managed to defeat the Burmese and reinstall authority. About two centuries later, the Burmese converged again on Ayutthaya. After a lenghty siege, the city of Ayutthaya fell and was utterly destroyed. This destruction of art treasures, buildings, historical records makes it difficult nowadays to truly visualize the splendour of Ayutthaya in its glory days. Phra Narai Ratchaniwet (King Narai's Palace) - Gate. 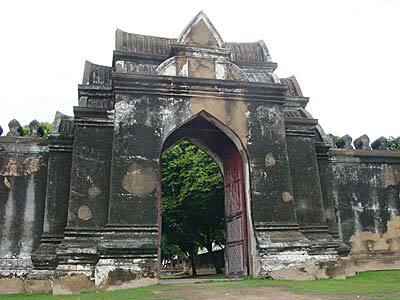 King Narai built his second capital in Lopburi in the late mid 17th century. Images by G.V., Bangkok, copyrighted.